How Long do Ski Helmets Last? Where to Buy Ski Helmets Online? What Size Ski Helmet do I Need? If you have ever wanted to go on the winter vacation of your dreams, you probably knew from the beginning that first and foremost you had to be safe! In our review of the best ski helmets, you will find the first piece of gear you should invest in. Maybe searching for a simple helmet is not always the most thrilling activity, but it is the shopping spree that could save your life! If you have already bought your skis, Ski pants, ski boots (click for full guide), ski socks, scarfs, balaclavas (click here for our review), and traveling bags, you will be able to choose a fitting helmet to suit the rest of your gear. If you haven’t yet bought your warm gloves & mittens – click here for Skiiers looking for ski gloves. Choosing a ski helmet can be tough, the sizes for each brand vary, some are naturally tighter or looser than others, the features vary and include many different options, from space for MP3 headphones to extra space for your goggles. There are many options to choose from, and even more colors, designs and patterns to pick during checkout. It is definitely a long and straining journey to pick a good helmet that will end up protecting you from concussions or deadly slip-ups. We hope that the reviews below that cover some of the best choices for ski helmets out on the market today will help you in your journey to choose the right product for you or your loved ones! Do you snowboard? You may wish to head over to our review on the top snowboard helmets. SmithOptics is one of those brands that will go out of their way to give you the biggest variety of color choices possible, just to make sure that you will be getting a helmet that will suit you and the rest of your gear! They give you over 20 color combinations to choose from and is a snug and comfortable fit. 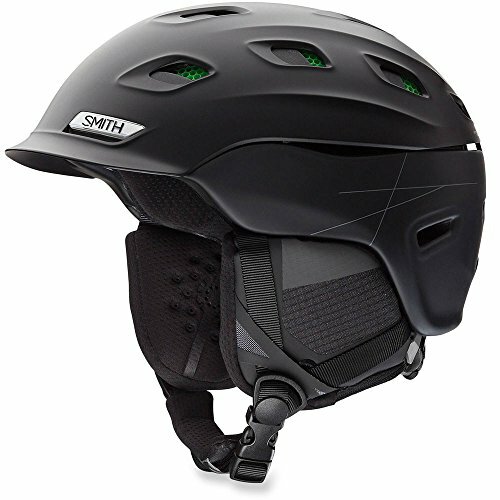 It won’t weigh you down with unnecessary additions and bulky pads; it will keep your head and neck straight thanks to the light-weight build and craftsmanship that SmithOptics invested in to provide you with the best helmet. It will keep you reassured when you are on the slopes and help you feel safe and comfortable when you are trying to have fun without noticing the extra luggage on your head. It’s easy to find helmets that will have vents and instead of just cooling you down, they will make you cold, but that isn’t the case with SmithOptic’s helmet. It keeps you warm and cozy both with the vents closed and with the vents opened, therefore no matter if you are sweaty or cold, there are options to make you feel comfy again! It’s one of the best helmets when it comes to air ventilation. Why We Liked It – It’s good to be provided with as many color options as SmithOptics provides their customers with, this ensures that you will undoubtedly find something just right for you and your loved ones! 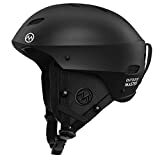 This is one of the best, functional and modern looking helmets out there and will protect you faithfully on the icy slopes if you bump into any danger! If you are looking for a professional ski helmet that is used by professionals, Giro will have you covered. Even though their helmets are expensive and usually not accessible to the general public, it’s well worth the investment since this kind of helmet can last you a lifetime of skiing! Ski helmets are designed not according to style and don’t care much for being fashionable, but about the design and how it can encourage the speed of the rider during competitions. That is exactly what Giro focused on when designing this helmet – a slick design that will still keep you safe. When you are speeding down almost vertical slopes and are focused on winning a competition, a bulky, heavy helmet probably won’t help. Giro’s helmets have gone on to lead the most successful competitors to win games at the highest level, and the GIRO Avance MIPS helmet is by far their most advanced helmet yet. This helmet gives you the ultimate protection from multi-impact crashes, a design that will encourage your speed, vents to help keep you cool and a simple yet still attractive design.Thanks to the x-static fibers that are wounded with silver pieces that naturally provide anti-bacterial properties, you can be sure your item will stay good as new. Why We Liked It – Giro is a brand that can be relied on and we can see it through the helmets they keep putting out for their customers. This skiing helmet is slick and has advanced features that will keep you safe and your item fresh and new; you will be protected from dangers and you will be able to enjoy skiing without worrying about staying safe, since keeping you safe is what Giro does best! This ski helmet from SmithOptics also has a very wide range of variety when it comes to colors, you have 14 singular colors to choose from when picking out one of these! You can get this helmet for the perfect price, sometimes even under 40$! It’s the finest offer for anyone that is looking for a more affordable helmet, especially when so many helmets can go way into costing hundreds of bucks. No matter what kind of weather you will be skiing in, this ski helmet is perfect for both light snows, summer ski parks and general use. This helmet can be customized with extra padding if extra protection is needed for harsher winter weather. The vent shafts integrated here are some of the greatest. They are easy to open to help let in some fresh air if you are getting a bit stuffy. The helmet can let out unnecessary heat from the vents situated in the back while still keeping you warm and cozy thanks to the sealed front end. The AirEvac system will give you the best airflow and removes any air that could cause fogginess in the goggle area. SmithOptics will keep you safe and dry no matter how much time you will want to spend on the slopes! Why We Liked It – SmithOptics has given its customers a ski helmet that is very affordable for anyone that is looking forward to a safe winter holiday. You will get extra cushions to make the helmet more snug if you prefer to do so, too. The versatility of this helmet is perfect for someone that likes to go skiing all year around and doesn’t want to invest in too many different helmets! Oakley’s ski helmet comes in five different variations of black/white/gray color options that should suit the surrounding snow perfectly.The brim ventilation system is one of the best and will help keep the top and sides of your head warm and snug while slowly letting out the stuffy air through the vents on the brims. That ensures you won’t get too cold or too sweaty too quick; the helmet will keep you protected and dry no matter what advanced slopes you will want to carry on skiing down! The vents are also easily adjustable and don’t need to be fiddled with to get the perfect amount of airflow. The liner within the helmet is also removable so that you can exchange it after months of usage. The only thing you should look out for when purchasing this Oakley helmet is the size chart, you should definitely get a size two or three sizes bigger than you expect to be sure that you don’t have a fit that’s too tight. This will ensure that you get a snug fit that will keep you safe and protected and won’t be loose. Either way, the BOA tightener should work like a charm in case you need to have extra help to adjust the sizing! Why We Liked It – Oakley has given their customers a very well-built helmet with a fashionable design and a fair price for all of the features that you get. You will be kept safe and dry and you will be able to slide down the slopes without worrying about getting too stuffy! This is definitely one of the finest helmets when it comes to craftsmanship and the best when you look at safety, too. A Giro helmet has once again surprised us with the advanced features that it offers to its customers- Giro is known for improving each of their helmets to make them the best on the market, and the Giro Ledge MIPS is no exception. There are more than 15 singular colors to choose from that can appeal to both women and men alike, as well as teens and kids if you are looking to buy helmets for all of the family! There are vents around the brims and on the top of the helmet to encourage airflow and to avoid making the ride uncomfortable in a stuffy helmet. There are removable goggle retainers and removable earpads to help you customize your helmet to suit your needs; for example, you can buy a compatible Giro audio system (click for sound perception on the slopes) to swap with the normal earpads. It’s also compatible with all of the Giro goggles and there should be no problem with mix and matching those. Even below freezing temperature, you can still stay warm while wearing this helmet and you will be able to bump into things without worrying about staying safe and secure- many customers reporting hitting against poles, snow and ice and reporting no injuries or cracks to the helmet! Why We Liked It – Giro has one of the best reputations if you take a look at the market of ski helmets, and it’s no wonder! They have some of the finest, well-crafted helmets out in the industry and are surrounded by five-star reviews all around. If professionals are happy and protected when wearing this helmet, you know that you will be too! POC’s ski helmet is available in 15 colors, from red, to white, to pink, to black and is one of the most affordable helmets on our list. It has the perfect price to combine both the quality and endurance into one durable and reliable helmet. The design is fantastic and gives a distinct skate-inspired shape that you can commonly see in skateboarding and skating parks. The adjustment system here is very precise and customers praise its accuracy; it’s very easy to adjust the helmet to keep it snug and in place without having it move around on your head as you ski. This is vital to have maximum protection and to not get any headaches from tight or loose fits. There are also no open vents visible on this skiing helmet, however there is a very smart system which lets the air flow through the outer shell. This takes away the hot hair that can accumulate around the top and side of your head, providing the best solution for a dry head. This can also be adjusted to either high or low level of air flow so that you can match it to the temperature that is dominating outside. This ski helmet also has a chin strap that has a comfy pad- it can be easily tightened without causing any discomfort around the jaw and chin area. + airflow system through outer shell of helmet, no vents needed! Why We Liked It – POC has given the market a the best selection of helmets, whether they be the simple, protection only helmets or helmets with audio and GPS installed within, this particular helmet is one of the best when it comes to snug fits and comfortable adjusting options, both around the head and chin area! SmithOptics once again makes their way onto our list with yet another high-quality helmet. There are 20 designs to choose from, both single and multi-colored and you should have no trouble finding something that fits you and your gear! SmithOptics also provides its customers with many unconventional colors that can help you to be more easily noticed on the slopes by your loved ones and friends. There are also Skullcandy systems available that can be integrated into the design of the helmet for the ultimate skiing experience. There is also a removable, very light goggle lock, a low-profile regulator that can help you adjust the climate around your head and the 18 vents situated around the surface of the helmet and snapfit earpads to keep your ears cozy and shielded from the harsh, cutting winds that you will certainly be exposed to in the mountains. They can also accommodate audio pads like mentioned before. 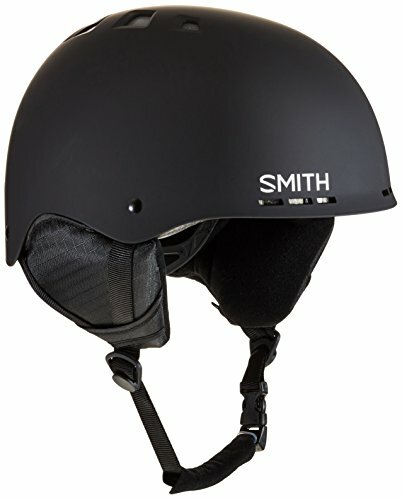 SmithOptics helmets all rank in the Top 30 list on Amazon when it concerns the ski helmet genre, and it’s easy to see why. The liner is removable which makes it much easier to wash, and the crash padding inside is well-situated and has adequate thickness to keep you well protected. Why We Liked It – If you are looking for a sturdy ski helmet, SmithOptics has the best option right here. They have once again given us a very wide variety of colors and designs to choose from, and this time also features like removable earpads so that you can add audio pads instead! The crash padding is thick and foamy and should protect you from any slips and falls and the vents will help keep the airflow flowing through your head! It’s truly the best if you are looking for a helmet that will undoubtedly protect you from danger. Bern is known for having very high-quality impact foam which will absorb all of the shock that potential crashes and bumps could generate. It has some of the best protective foam out there. There are vents situated on the top and back to help encourage airflow when skiing and the design is a very unique, green mint color combined with dark blue brims around the straps. This helmet functions well even in the harshest of weather conditions, the winter liner is perfect for keeping you warm even when the temperatures are below freezing. Many customers praise this helmet because it can be used for both skiing and snowboarding, which will save you a few extra bucks- instead of buying a snowboarding helmet, you can just buy Bern’s skiing helmet and you will have two for the price of one. The thin yet durable shell helps to make this helmet look a bit more fashionable and to not make your head look big, like many other ski helmets seem to do. Many customers are happy to report that they are able to use this helmet not only for skiing but for summer bike rides too, if you remove the winter liner and buy the summer liner that costs about 10$, you will be able to use this helmet all year round. No matter if you like snowboarding, skiing, biking or skating, Bern is known for having the most versatile helmets out on the market, and this helmet is definitely one of them! Why We Liked It – Bern has made the most versatile skiing helmet out on the market today, you will be able to use it all year round if you are willing to switch between the winter and summer liners, which is laughingly easy! It’s the best helmet for anyone that is looking to keep up their sports all year round while still staying safe and also one of the best choices for budding skiers! ZIONOR will offer you full protection out on the slopes, no matter if you will be facing harsh weather or bumps and scrapes from falling down. This ski helmet is available in four colors: black, blue, cracked-black design and pink. It also has a solid compatibility with goggles, they won’t be sliding off when you put them onto this helmet and the goggle loop on the back helps to keep them in place. You will not have to worry about losing them on the slopes even if you are going down hill and/or at high-speeds. There will be no need to keep adjusting them, either, since this technology is some of the best. The helmet itself is very comfortable and customizable, the chin-strap is sweat-absorbant and will not leave you feeling stuffy, irritated, itchy or plain uncomfortable. There is also a regulator situated on the helmet to help you open and close the vents easier than with sliders. If you are experiencing too much wind in the mountains when you are speeding down, you can turn the dial and close the vents within seconds. If you are feeling too steamy and want to have some air flow to remove the heat you can turn the dial the other way and within seconds get access to this option, too! Why We Liked It – ZIONOR is a brand that has made only the best quality helmets, and this is one of them. The sport and modern look encourages everyone to look their best without getting their head to look too bulky like is common with many other helmets. There are many useful features here, the most notable being the goggle compatibility- you will never have to worry about those sliding off ever again! This is one of the best features that ZIONOR has to offer over other helmets. Salomon has given the market a very modern looking and fashionable ski helmet; it’s definitely not a helmet you see every day, it’s designed to look attractive so that you can finally stand out among your peers! It’s available in two colors: black matt and gray matt. The earpads are removable so that you can exchange them for summer alternatives or to put them in the wash after an intense holiday or training session. Thanks to the active ventilation you won’t have to worry about ever getting stuffy inside your helmet since the vents will keep the airflow around all the time. This way you don’t have to fiddle with any dials or straps! The sizes here are great fits and the construction is of very high-quality, they are typically available to be used for about five years of heavy-duty wear on the slopes. The air adjustment system is intelligent and will leave you to enjoy your holidays and practice sessions without worrying about staying safe and dry. The customers have rated the sizing chart to be very accurate, unlike with many other helmets, this means that if you end up liking the features that this helmet has, you also won’t have to worry about getting a fit that is either too loose or too tight. Why We Liked It – Salomon has provided the market with a very durable piece of ski gear that has all the necessary features to perform best in the winter season. The vents will help keep the airflow flowing, the straps will keep the helmet snug on your head and the heavy-duty craftsmanship will ensure you get years of use with this helmet! It’s the best choice if you are looking for an affordable and comfy helmet. Ski helmets are meant to be used and to be used a lot! Some people have professional careers that involve skiing and that can mean that they need special, heavy-duty helmets that can endure a lot of wear and tear, bumps and scrapes and many other accidents that could happen. Some people like to only go on winter holidays to the mountains or to ski resorts, and this means they don’t need such heavy-duty helmets as professionals do. Whichever party you belong to, there are a few things you can definitely look for if you want to check how long you can keep using your ski gear for while still staying safe and protected. Some helmets have a shorter lifespan than others and it’s definitely good to know when it is so that you can be prepared to know when you need to buy a new one! Usually you will find the information about the lifespan of your particular ski helmet in the product description on the website you purchased it from, if you bought it from a shop, it should be listed in the instruction manual. The typical lifespan is about 5 years if you are looking at casual use, this means taking your gear on occasional holidays and the alike. Casual use also applies to people that regularly (once every few months) enjoy going to ski resorts to ski and like participating in some other snow-related activities. The lifespan also depends on the helmet itself and the materials that it is made of, some helmets have bulky and very thick shells with thin liners, while others have very thin outer shells but with very thick shock-absorbant liners. This can mean some helmet can take more beating than others, and in return have either a longer or shorter lifespan. Usually professionals recommend that if you suffer a major accident or collision it’s best to buy a new one, since the foam will have already molded itself to absorb the impact that you suffered through the accident and will not provide as much tight cushion and protection as it did when it was protecting your head before the collision. Even if after five years you think that your helmet is still in tact and you are too attached to let go of it since it may be comfy and offer some good memories, you should think again. Even dropping your gear on a hard surface could result in dangerous dents in the foam, and the foam usually only works with 100% protection when its new, since after a collision the impact reshapes it. Sweat, hair products, washing and detergents can also weaken both the shell, liners and foam of the helmet, which can also mean a shorter lifespan and a weakened protection. Regardless if you think your gear it still as good as new after four or five years, it definitely needs a change, especially if you have been using it regularly and giving it the proper wear and tear and washing care that it should get! After all, a new helmet is way less expensive than a trip to the emergency room. Choosing the right ski helmet can be one of the toughest decisions you will have to make when you will be buying your first set of winter gear or if you will be stocking up on new gear after the old one has already been used for months or years. This seemingly insignificant plastic casing can protect and potentially save your life from any incidents or bumps that you may run into on the slopes or around the ski resorts or during challenges or practice sessions. The truth is, accidents can happen anywhere, and sometimes it won’t depend on you. Many people seem to think that not wearing any ski helmet is reasonable since they are experienced enough to not get into any accidents or trouble, but the truth is that some accidents can happen to you too: some inexperienced person or group can ride into you, you can slip on a piece of ice or a root, the road can get too steep too fast and a forest can be surrounding you. The scenarios are endless, and at times like these, when you won’t know what to expect from the snowy winter world surrounding you, you will need to be able to choose good ski head protection to keep you safe. Stay safe on the slopes, a helmets can save your life while skiing. If you are going to go out on the slopes with your friends or family it’s vital to keep your helmets recognizable, especially if you will be taking a holiday with your kids or if you want to enroll them in a training program, either alone or with the family. Choosing a good, bright colored ski helmet for you, your friends and loved ones will ensure that you will run into way less problems along the road. First of all, you won’t have to be looking out for each other as much in the sea of gray and black ski helmets common nowadays, but you will be able to very easily recognize each other and no one will have the chance to get lost. As for the helmet itself, everyone wants something different. Some people like to have a modern looking, slick helmet that looks fashionable and good on the slopes and will add speed, while some people prefer to have normal looking, bulkier helmets that have a thicker shell. Some helmets come with audio pads that allow you to communicate with your relatives and friends, while some helmets have simple, plain normal pads that just protect the ears. Some helmets give you the option to have both, since they have a removable liner. Whichever it is, you will need to decide what suits you best in that scenario. Do you need a vent regulator, or do you perhaps prefer to have open vents that can’t close? Maybe you like to have chin straps to ensure that your gear stays on tight and snug, if not, maybe you like to have a very secure goggle lock to make sure they won’t slide off when you’re trying to be a bit more aggressive with your skiing. Whichever it is, you will definitely have to take a long, hard look at all of the options and decide what features you will need and which you can discard. 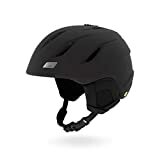 Amazon is always a great choice when it comes to seeing the best-ranked helmets, you can also order them from the cheapest to the most expensive, narrow down the search options to just search for kids, womens, teens or mens categories or perhaps even search by brands. Being able to state your preference from the get-go like this will give you only a limited set of results that will be meeting all of the criteria that you previously checked. Most of the helmets online are available in more than 20 colors and the features are very adaptable to the customer’s needs. For example, a removable liner that can be replaced with dr.dre or skullcandy earpads that can help you listen to music while you are skiing. Another great website is Giro’s official website. Giro does not only offer dozens of ski helmets to choose from, but they also offer a variety of tips, advice, in-depth descriptions about their products and FAQs. This will ensure that when you will be browsing for your ideal helmet you will have all of the answers for your questions right under your nose. Giro is famous for their durable ski helmets and most of all because their products have gone on to assist professional during the Olympics and other important events. On their website you will get a very clear history of each helmet, how Giro got round to making it, why they got around to make it, how it is different comparing to their previous products, what it can offer you, why you should buy it and most importantly of all, they will provide you with a clear, simple and crisp explanation about all of the advanced features used within their helmets without using any jargon. Evo.com is another fantastic website- they will give you all of the latest deals and sales on all of the best rated ski helmets out there right on the front page. That way you will always know what deal you can catch last minute if you are looking to save a few extra bucks while still getting quality helmets. Evo usually also matches suitable goggles to each product to help you pick your perfect winter set. You can check whether you want to be able to only view the items on sale, the outlet items are all of them at once. You will also be able to check boxes for sizes, gender, availability, brand, color, material, style etc. This system will help narrow down your options to your preferences within seconds and in turn help you get the most of your future helmet. Some people may still think that buying anything that needs to be tried on beforehand on the internet may be risky, but helmets have a variety of sizing charts (each usually unique to each brand) that can help you pick the best helmet for you, for your family and friends. It can be very tricky to buy a ski helmet online that will fit your head, after all, you can’t try it on! That usually causes a lot of people to shy away from buying helmets online, even if they can’t find something they fully like in their local shops. First you will need to measure your head or get a relative or friends to do so for you, after finding the size of your head you will be able to quickly match a helmet suitable for you from the size charts that each brand offers on their official websites. These charts usually differ significantly from brand to brand, which means you shouldn’t be interchanging them when buying different helmets. The trick is to then choose a product that is at least one or two sizes bigger than your head. Usually, the extra padding, the thickness of the shells and the liner affect the size of the helmet itself and may make it feel rather tight and uncomfortable. It’s much safer to go for a looser fit and be able to adjust it with the straps than to get a helmet that is way too small for you and in the long-run, might even cause you headaches! You can also go to your local store and get a feel for how certain helmet sizes from certain brands feel, even if you don’t like the design you will be able to judge the size quickly and accurately and that will be able to help you make a better choice for when you will be purchasing your new gear online! SmithOptics has to be our Top Choice, simply because they give their customer a simply stunning amount of choices when it comes to choosing the color and design of the helmet. No one wants to settle or be cornered with just one design or color, and SmithOptics knows that well. From blue, to army green, to turqoise, you will definitely be able to find a color here that will suit you and your family members and friends, this in turn will help you stick out among the crowds on the slopes and help find your partners easier. This ski helmet is in the Top 15 on Amazon and is praised by customers for both the craftsmanship and durability that it has, both of which are simply some of the best. The ski helmet is light and easy to wear and won’t bring you any extra weight- that is vital when you are competing in challenges or if you just care about being able to easily keep your neck and head straight without a big, bulky product weighing it down. If you are willing to spend a bit more, this is definitely the ski helmet you should go for if you want the best, light-weight helmet you can get. Thanks to SmithOptic’s features, superior ventilation, variety and light-weight build, it has to take the spot as our Top Choice! It’s simply the best rated ski helmet for the price and features that you can get. Our Premium Choice spot has to go to one of Giro’s ski helmets, it’s truly a superior when it comes to durability and all of the features that it offers you. The x-static padding provided here is made with layers of pure silver that are integrated into the fabric; pure silver has natural anti-bacterial properties which means your ski helmet will stay fresh and regulate the heat and reduce any bad odors. The shell is designed to be able to withstand many bumps and scrapes and will keep your head secure should any incidents happen; if you fall over or bump into someone or something you can be assured that your head will be protected. The goggles are also very compatible with this ski helmet and won’t be slipping off alone, especially if you choose suitable Giro goggles, since both the ski helmet and goggles are made to perform as a single product, working together. This way you can stay worry-free when you are trying to have fun on the slopes, which is vital for both practice sessions and simple holidays! Thanks to Giro providing us with all of these vital features, like the light-weight shell, the x-static padding with pure silver linings and goggles that seamlessly fit into the ski helmet design, it has to be our Premium Choice! It’s the best quality helmet out there. SmithOptics also offers a gigantic range of variety even when they offer you a ski helmet at a Great Value! And that’s why our Great Value spot has to go to SmithOptics ski helmet. There are 14 colors to choose from and you can pay as little as 30$ to own this fantastic helmet! Depending which deal you can catch, this helmet is definitely the most affordable helmet on our list. It’s an all-weather helmet that can be customized to be used both during winter and summer time, which is why SmithOptics are so popular among customers. Not only are these products colorful and inviting but can be used all year round if you are willing to pay ten extra bucks to exchange the liner! The ventilation system is independent and is able to control the front and back vents without letting out too much heat but while still keeping the head warm and dry. This amount of airflow will allow you to stay comfortable and dry, no matter how intensive your training sessions and/or holidays are. SmithOptics will keep you protected, safe and dry no matter where or when you ski! Thanks to all of these features, SmithOptics not only gives us an affordable ski helmet but also a reliable and durable helmet, this is exactly why our Great Value choice is this particular product! It’s the best choice if you are looking for a good, reliable and solid piece of gear to add to your arsenal. Choosing a good ski helmet can determine how safe and protected you are when you are out in the mountains or sliding down around dangerous ski resorts. Having safe gear that can keep you shielded from the harm that you can encounter outside is vital, so vital that your life can depend on a simple piece of plastic! Whichever ski helmet you choose, the important thing is that you choose the right size and that you have a helmet at all, since it can definitely save your life (read the study) in times of trouble. For the effectiveness of ski helmets – click here.